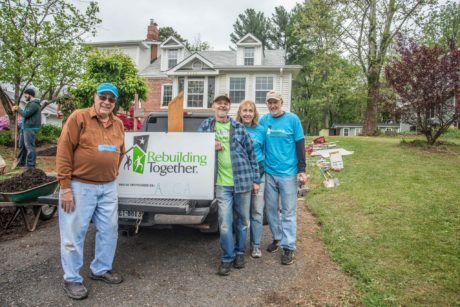 The 2016 ACCA/Rebuilding Together Home Repair project demonstrated love made visible in the hands-on, paint-spattered and mud-stained efforts of some 70 volunteers. Together, they repaired and rehabilitated a group home for adults with special needs and the home of a 71-year-old widow. Volunteers painted the entire interior of the group home, repaired and rebuilt the front steps and railings and did extensive work cleaning gutters and improving the drainage around the house. In addition, they made many minor repairs and did yard work, clearing brush and removing a lot of pesky poison ivy. Participants from Holy Spirit Catholic, John Calvin Presbyterian (JCPC), Providence Presbyterian and Ravensworth Baptist (RBC) churches were led by Brad Moffett (RBC) and Jim Stewart (JCPC). Queen of Apostles provided lunch. At the second home, volunteers painted a timber wall, repaired and painted two decks, and installed two new railings. They also repaired the shed roof and doors, painted window trim, installed screens, and cleaned up the yard. Inside they installed a kitchen faucet, ground fault circuits, bathroom grab bars and a shower curtain and made a number of minor repairs. Participants from Annandale United Methodist Church (AUMC), the Church of Jesus Christ of Latter Day Saints Annandale Stake and St. Barnabas Episcopal (St.B), were led by Ken and Camille Mittelholtz and Frank Spink (St.B) and John Clarke (AUMC). Lincolnia Methodist Church provided lunch. Thank you to Marie Monsen, ACCA Housing Repair Chair, and all who volunteered, provided food, and supported our work through their donations. The hugs and tears of joy from this year’s recipients matched the warm glow the volunteers felt at the end of the day. See photos on the ACCA Facebook page and an article in the Annandale Blog.